I took a tip from the Indians with this recipe: They always have a creamy cucumber salad to go with their meals. Called raita, it is merely shredded cucumber dressed with yogurt, seasoned with garlic, salt, pepper and, perhaps, paprika. It is refreshing, cooling - wonderfully alleviating the heat of spicy food - and yes, healthy, using probiotic-rich yogurt. Probiotics, which are live bacteria and yeasts that are good for your health, help hugely with digestion. This is aside from the other nutrients found in yogurt. I went a step further and used low-fat yogurt, simply because I do not like the richness of a creamy dressing, aside from the calories. It was hugely successful and is excellent especially with dishes that are heavily spiced for it provides a clean yet delicious palate for all the other flavours found in the meal. I pondered later if I could use yogurt as a base for all the other "creamy" dressings you find in salads, the most popular of which must be the caesar and potato salads. Of course, you could always dress a potato salad with just oil and vinegar, the classic vinaigrette, which I love. I don't think that there's anything better than boiled potatoes dressed with an aromatic oil, lemon juice, salt, lots of pepper and perhaps a seeded mustard for bite. And if there are walnuts or macadamias in the salad, it is divine matched with an oil, made from the same nuts. I opted for yogurt because it is nutritionally as rich as the milk used to make it but has benefits beyond milk, due to its probiotics. Lactose-intolerant individuals may tolerate yogurt better than other dairy products, for example. But sometimes, for a change, I yearn for a creamy, velvety dressing, sharp with mustard, to dress these potatoes, lavished perhaps with smoked salmon and enlivened by salty capers. While creaminess in a dressing could come from mayonnaise, sour cream, buttermilk, cheese or egg, you could use instead a host of other more innocuous and healthy ingredients. Gado-gado, which is an Indonesian salad of boiled vegetables, egg and soya bean products, for example, has a dressing enriched by nothing more than ground peanuts. The Japanese use soft white tofu to make a creamy dressing for their (usually cooked) vegetables and you could, of course, fall back on avocado, soya and nut milks or... yogurt to add creaminess to a dressing. Choose tight and unblemished heads of lettuce. Wash and drain them whole. • Cut the heads into wedges without removing the core, which holds the leaves together. • Put together the dressing: Place yogurt, oil, garlic, salt, honey and pepper in a bowl and whisk well to combine. Taste to adjust seasoning to your liking. 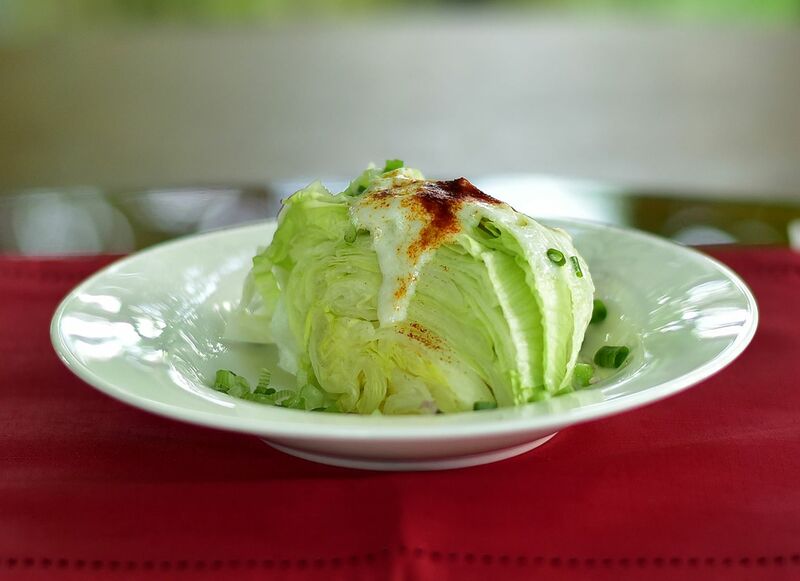 • Place lettuce wedges on a plate and pour the dressing on top. • Scatter spring onion and, if you like, a dusting of paprika for colour. Perfect accompaniment for spicy Asian dishes. And the good news is that the low-fat version is as nutritious. But do remember when employing yogurt in a dressing that you need some sweetness to counter its inherent sharpness. Here, I use a bit of honey, but you could use sugar, always keeping to the ingredients found in a traditional raita, that is, yogurt, mixed with some oil, chopped garlic, salt and pepper. I pour this dressing, thinned down with oil, over iceberg lettuce, often dismissed for its lack of taste, but I like it for its crunch and juiciness, perfect for hot weather eating. You could use other salad leaves, if you so prefer, but I'm always looking for a new way to dress my iceberg lettuce. And this raita dressing adds lots of creamy flavour while a scattering of chopped spring onion gives a gentle bite of onion.